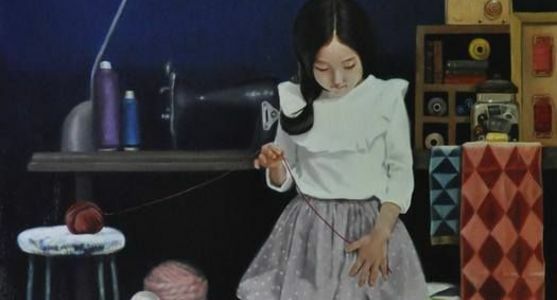 Hye-Jeon Kim has MAF in fine arts from the keimyoung university in korea. She had 4 solo exhibitions and praticipated several group exhibitions which was held in korea. She won the grand prize at the Grand Arts Exhibition of Daegu and various other contests. She recomposes nature, things, animals and figures available nearby and tried to represent the inside of men metaphorically through symbolism, coping with the limitation. She explained her own works. "An artist shows his/her own inner world or a subjective writer's consciousness, but after all, could not but speak of the life of the contemporary age. I myself, as a modern, also tried to represent the sense of alienation or the emotion of loneliness in the conflict caused by diversified relations through the visual arts painting. It is my work coming in the purifying procedure to heal myself and communicate with the world through my own space, recognizing through my works the sense of alienation and the emotion of loneliness the moderns feel."